Is Jesus The Same As Issa? Let’s settle this issue once and for all today. Christians claim a lot of things about Jesus which Muslims deny. Muslims claim a lot of things about Issa which Christians reject. They are two different men! Let’s find further evidence to see if this could be true. – according to the Bible, Jesus died on the cross and rose again. – according to the Quran, Issa did not die but was raised up. because everyone knows these things and we argue about it everyday. Let’s look at a few other crucial details for these two men. Jesus was born in Bethlehem. Issa was born in an unknown town. Muslims will say this is an unimportant fact about Isa. That’s why the Quran does not record it. That’s the thing! The place of Jesus’ birth is VERY important! 500 years before Jesus was born, the prophet Micah predicted that Christ would be born in Bethlehem (Micah 5:2) for the Jews to know their Messiah. If it was unimportant, why did this prophet of God say it? It is recorded in the Bible. It is not important where Issa was born but it is very important where Jesus was born! Jesus said. “My words will never pass away.” (Mark 13:31). But according to Islam, Issa’s words, in the Injeel, passed away, got lost, corrupted and does not exist anymore. But we believe the words of Jesus did not pass away, just as He promised, and was recorded down by His disciples and exists as the Gospels today for us. We even know who Jesus disciples were, what they preached and taught and wrote down. On the other hand, Issa also had his band of sahabas but they are unknown. They are lost in history, nameless and voiceless. Again two different men. You can go on believing that your Issa lost his words and his sahabas failed to carry on his message. That’s your right. But we have the assurance from Jesus Himself that we have His words recorded down by faithful men who lived and died as martyrs. The only common thing I can think of right now between these two men are the name of their mothers. Mary/Mariam. This does not prove that they are the same person, does it? 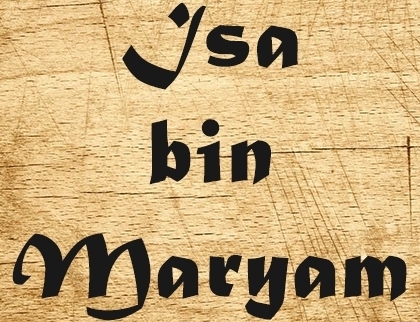 Many people are named Mary / Mariam and does not prove that they were the same person. Besides, according to the Quran, Mariam’s father is Imran. This is not the name of Mary’s father. His name was Heli. So they are two different women. Obviously their sons must be two different men. Their mothers had the same name but are the names of their sons the same? Jesus is derived from His Hebrew name, Yeshua. This would be translated into Arabic as Yasu (يَسُوعَ) and this is the name we find in the Arabic Bible. Is this the name that we find in the Quran? No. No one named Yasu in the Quran. What we find in the Quran Issa ( عيسى). But Issa is the Arabic translation of the Hebrew name Esau! This is what Ahmed Deedat himself taught. Jesus is Yasu not Issa. Issa is Esau not Jesus. It’s so plain to see. Two different men. If you do not agree, then you would have to prove that Issa is the same person as Jesus. The mother of issa is Miriam the sister to Aron, that makes issa call moses his uncle…. Utter confusion!!! Yes.. They are two different people and issa an imposter finding to be accommodated in the Bible… devil’s workmanship. Christians stay away from issa.